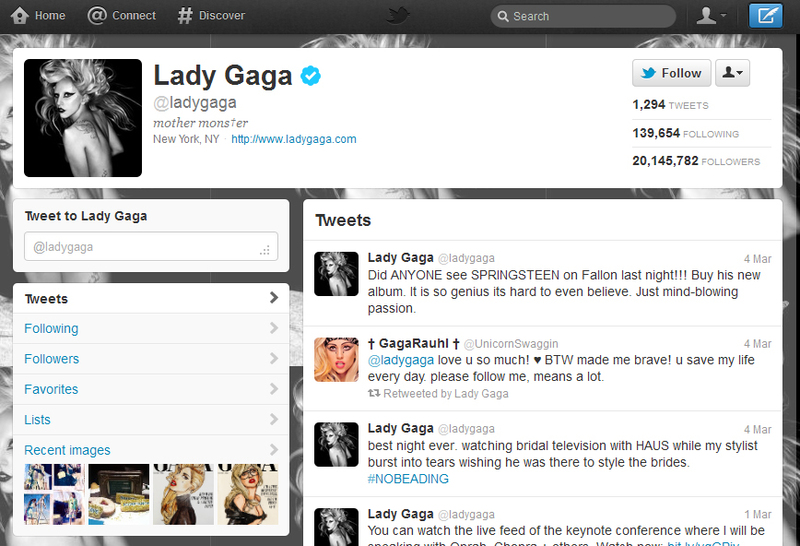 Lady Gaga, hits the 20 Million mark in Twitter last Saturday, March 3, 2012. She is the first person to get 20 million followers in Twitter. She beats fellow celebrities like Justin Bieber (18 million followers), Katy Perry (15.7 million followers), Shakira (14.5 million followers), Rihanna (14.4 million followers) and Britney Spears (13.5 million followers). Unlike her fellow popstar, Britney Spears, whose account is maintained by her management team, Gaga claims to personally manage her account. She often posts announcements and personal pictures, using her account to get in touch with her legions of fans, whom she calls her “Little Monsters”, helping her retain her title as the “Queen of Twitter”.